I spent this weekend at my parents’ house in my hometown of Saugerties, New York, which is nestled nicely between the Catskill Mountains and the Hudson River. It is always nice to visit and give Desi a chance to have a yard to play in and cousins to play with, to say nothing of eating some of my mother’s delicious home cooking. One of Desi’s favorite things to do when we are visiting his grandparents is wander around the yard looking for bugs, amphibians, reptiles, birds, mammals – basically, anything living thing. He saw his first Garter Snake a couple of weeks ago on one such exploration and he is always excited to see Red-backed Salamanders, Cabbage White Butterflies, and Eastern Chipmunks. But what we found hiding amid the Black-eyed Susans on Sunday was clearly his favorite creature of the year. And what’s not to like about a Gray Tree Frog? 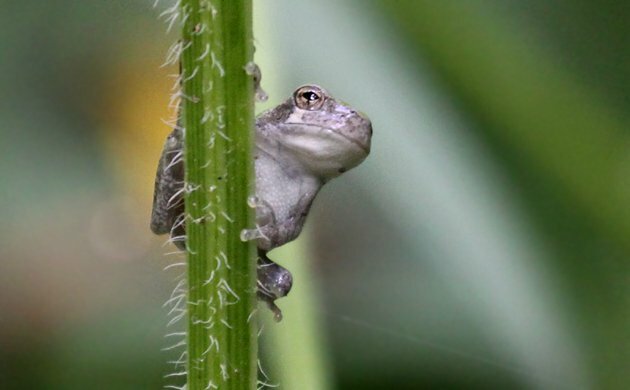 Heard far more often then they are seen, Gray Tree Frogs are an adorable little frog. The only bummer about seeing this frog is that Desi and his cousin, Timothy, convinced me to try to catch it because they wanted to touch it. It proved too fast and escaped into the flower bed. Shortly afterwards, my mother came home from running some errands and was not happy about missing this photographic opportunity. She, after all, has a blog to fill! 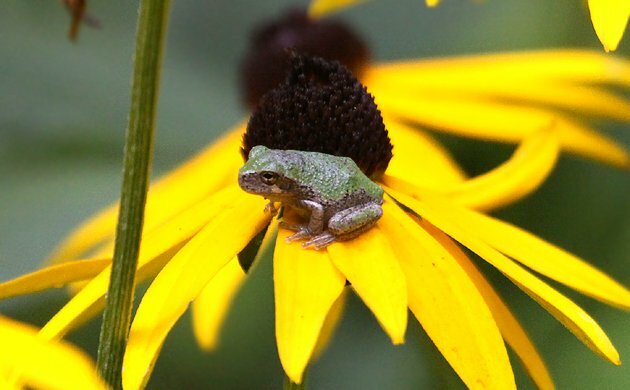 Oops – as you can tell by the URL, I had accidentally originally identified this frog as a Spring Peeper. Thanks to Greg Neise for setting me straight.